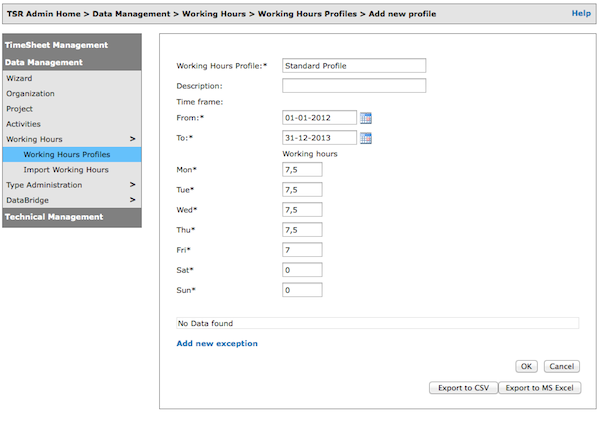 This page allows you to manage and define Working Hours Profiles (number of hours supposed to be reported) for different users. Step 2: Click the Search button to get results. Step 1: Click “Add new profile”. Step 2: Input necessary information and click the OK button. Step 3: Add an exception to the profile by clicking “Add new Exception”. Step 3.1: Enter the necessary values and click Update. Step 3.2: Click the OK button. Step1: Click the Working Hours Profile name that you wish to update. Step2: Input the necessary information and click the OK button. Menu path: Data Management > Working Hours > Import Working Hours. Step 1: Enter necessary information. Step 2: Select a CSV file by clicking the “Browse…” button. Step 3: Click the Preview button to view the data or click the Import button to import data to TSR database. Step 1: Click the Working Hours Profile name you wish to export. Step 2: Click the “Export to CSV” or “Export to Excel” button.